There a several ways that you can copy nodes and flows between flows in the node-red Workspace. This works just like copying text in a word processor. You simply select the nodes you want using the CTRL key to select individual nodes together into a group or CTRL+A to select all nodes in the workspace. Then use CTRL+C to Copy. You then move to the place on the workspace or open the workspace where you want to copy the nodes to and use CTRL+V to paste the nodes/flow into the workspace. Note: This only works for flows in the same workspace. This method can be used for exchanging flows between systems as well as on the same system. 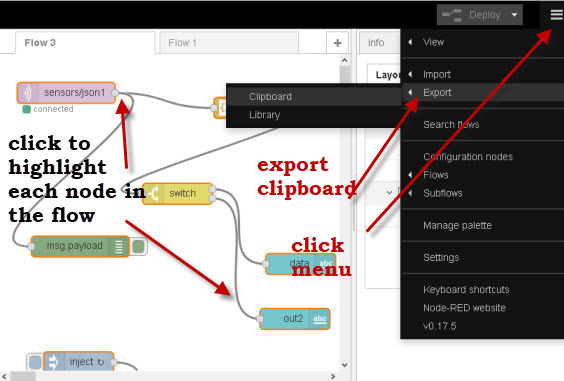 To do this you need to highlight each node in the flow and then click on Menu>export>clipboard. Note: Use CTRL+A to select all nodes in the workspace. The contents of the export file will be displayed click on export to clipboard. You then need to open a file editor and paste the contents into the file using CTRL+V. You will need to open the flow in a text editor, and then copy its contents using CRTL+C. 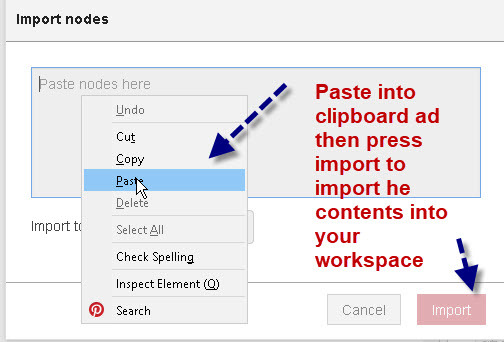 You then go to Menu>import>clipboard and paste the file into the window and click the import button to complete the import. If you find that the import button doesn’t change colour and a red line appears around the text box it is probably because what you are trying to import isn’t valid JSON. A confusing issue I found is that my export file verified OK using the JSON checker but failed when doing an import at a remote location. The problem was due to smart quotes in the export file. I pasted the file into this online smart quotes removal tool to remove them, and then sent it, and it worked OK. If you want to save a flow or function and reuse it in another flow then you can save it to the local library. To save a flow to the library highlight all nodes in the flow by using CTRL+A then use the main menu (top right) and select Export>Library. You will need to give the flow a name and optionally you can create a folder for the flow. For example you could store flows in the flows folder and functions in the functions folder. All flows are stored in the lib folder under the users .node-red folder. You need to give the file a name and optionally a folder to store it in. Note: The function itself should have a name as you will need this when importing the function. If you don’t give the function a name it appears as an unnamed function when importing. To use a library function drag a function node into the flow canvas then open it for editing. 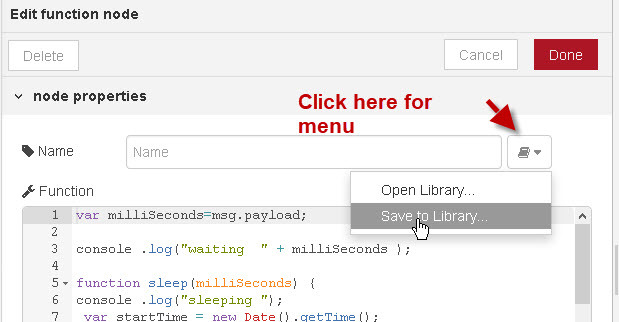 Click on the bookmark icon next to the function name and select open library from the drop down menu. Open folder containing functions and the functions appear by name. 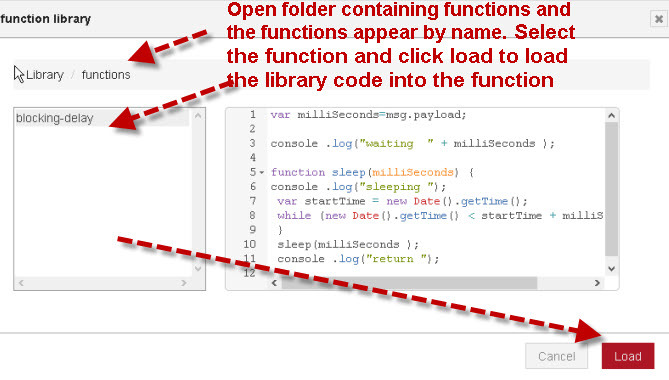 Select the function and click load, to load the library code into the function. Q -Can’t I just export the flow to the clipboard and copy it to a text file? Q- Can I use libraries to copy flows between computers? A- Yes but it isn’t as easy as using the export clipboard option? Q- Can I share my library files with others.? A- Yes you would need to copy the lib folder which is under your .node-red folder. I assume you mean the code for the actual nodes. Not as far as I a aware. Is there a reason why you need it? – Given that I have a few small (pi-driven) node-red instances out in the wild – all having the same set of flows. – And I periodically may need to update these flows (correct errors, improve functionality etc). – Is there a way to automate this process and do it OTA? 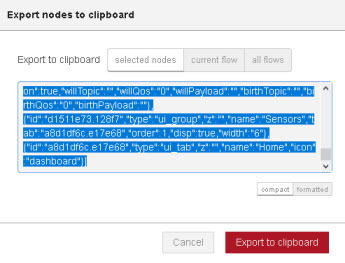 For example have a node-red flow check for updates and then update other flows as required. Not that I know off but a good idea. I’ll look more into it.